Black Swan VoiceCentral is a new unofficial web application from Riverturn that gives you access to all your Google Voice functions from your iPhone using a hosted web based interface. It is important to note that Apple has already removed all existing Google Voice related apps from the App Store, so you won’t find this app there. To get Black Swan installed on your iPhone visit the Voice Central registration page to get started. You can use the webapp in a free ad supported format, or pay for an annual membership to go ad free, which currently costs $10/year (the introductory sale price is currently $6/year). Enter your Google Voice email address and check your email for a link that will send you to the URL for installing the webapp on your iPhone. Once you get to the URL, you’ll see a message saying “congratulations! the application has been installed successfully.” But to get to it, you have to tap the + icon on the bottom of the screen, and choose “Add to Home Screen” which will put the Voice Central app icon on your iPhone. Then you can just tap on the new Voice Central icon to get started with Black Swan every time. If you notice that each time you open Black Swan you have to validate yourself by verifying some text on the screen before you get logged into your Google Voice account, you might have the Captcha lock from Google enabled. In that case you can try to go this Google page for unlocking your Captcha. Voice Central then updates your contacts, recent calls, SMS, and Voicemail from the Google servers into the app. Black Swan is broken down into six tabs: Recents, Contacts, SMS, Voicemail, Keypad, and Settings. The app is designed to look almost identical to the native iPhone interface so using it is quite intuitive and self explanatory. Here are the features you’ll get with the VoiceCentral Black Swan app for Google Voice. Recents: List of your calls, colored red if missed with date of calls. Tap the right arrow on any call to see a Details section where you can use either the iPhone or Google Voice to call or SMS the caller back. You can also view notes about the call and see call duration and detailed stats. Contacts: Again almost identical to the Contacts app on your iPhone, here is where you’ll see all your Google Contacts. You can search for people by keyword, and add them to your Favorites (a premium feature). Searching works in real time. There is also a sync button that you can tap to force an update of contact list. Tap on any contact to see all their contact info and place calls to them from there. SMS: See a list of all your Google Voice text messages, and compose new SMS messages to anyone right from the Black Swan app. A great feature of Black Swan is that all of the screens, including the SMS compose window work in both portrait and landscape modes, great for typing. Voicemail: See a list of all your Google Voice voicemails and tap the play button to have Black Swan download and playback the audio file of the voicemail. Tap on the blue right arrow on any voicemail to see the details section, where notably you can read the transcript of the voicemail, amongst other things. 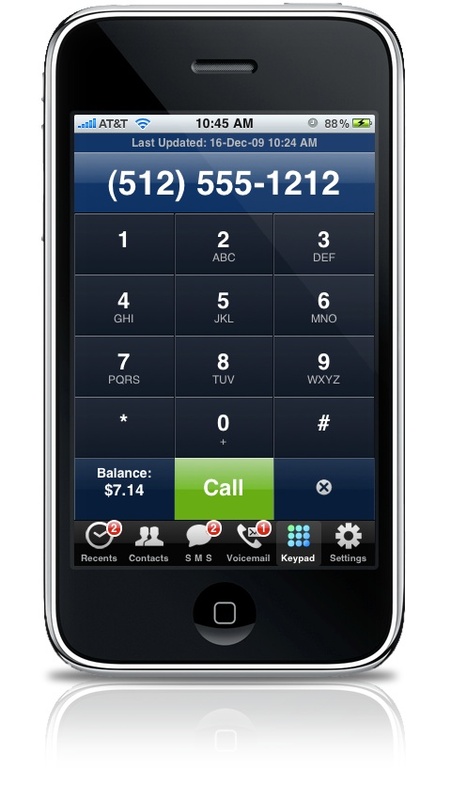 The Keypad again is much like the iPhone dialer screen, with one exception, that the add caller button on the bottom left is replaced with your Google Voice Account Balance which is very handy to have but is only a premium feature. There is no access to your contacts from within the Keypad tab however. The Settings section gives you a plethora of Google Voice account information and options such as login info and billing history (premium feature). You can also see your Call Back number, edit your Do Not Disturb feature (premium only), edit the Refresh on Launch setting to be anywhere from 15 to 2 hours, or even never. We prefer the never option, since Black Swan provides handy refresh icons across the app anyhow, and we can easily update things whenever we need that way. Finally you can set the display and sorting options for your contacts to be either First Last, or Last, First. If you’ve been dying to play with Google Voice features on your iPhone, and have already tried the Google Voice Webapp, you might want to try the ad supported version of the VoiceCentral webapp. Even though you are running Black Swan as a web application you never see the address bar or menu bar’s of Safari, which makes the user experience a little cleaner than that of the Google Voice Webapp. The number of ads in the free version of Black Swan are a little bit too much at times however, something you don’t have to deal with when using the official Google Voice webapp. However you can opt to pay a few bucks to remove the ads, and get the premium features as well. Overall VoiceCentral Black Swan is a wonderful alternative for Google Voice lovers on the iPhone. AppSafari review of VoiceCentral Black Swan was written by Joe Seifi on March 9th, 2010 and categorized under Phone, Utilities, VOIP. Page viewed 8659 times, 2 so far today. Need help on using these apps? Please read the Help Page. Nice… but is this webapp only working in the US ? or worldwide ? I loathed Apple for removing gvoice apps from the store and especially for rejecting the official google voice app. This web app is just down dirty. Great work.